I recently saw Ben Nadel’s blog post that did a great job of introducing the built in browser support for geolocation. 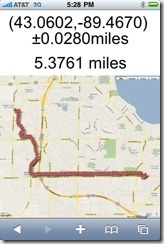 I have been meaning to write an iPhone client to collect and save GPS data as part of the Truck Tracker project. However, this browser-based location services have the advantage that I can write on web-client and it can be used on any browser that supports the API. This post will explore creating a stand-alone (no integration with Truck Tracker) prototype. The image on the left is a screen shot showing the application as it looks right after being loaded. Pressing the “Start Trip” button begins the collection of GPS points and transitions the application to the middle image. Status (number of points, current lat/long with accuracy, and distance traveled) is being updated while points are collected. My iPhone was capable of a sub-second acquisition rate. 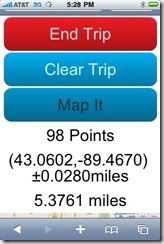 However, the code (see below) only stores points that are further than 0.05 miles from the last point. This prevents data piling up at long stop lights. 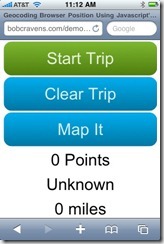 Pressing the “End Trip” button will stop the collection of data points and will display the “Start Trip” button. 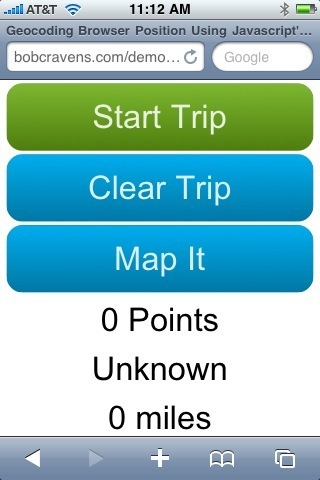 You can then restart collection on the same trip of clear the data by pressing the “Clear Trip” button. The “Map It” button renders the GPS points on a map using the Google Maps version 3 API. The first ‘div’ is a container for the controls and the status information. The three buttons are anchor tags. The status is shown using three ‘div’ elements. The last ‘div’ is the map container. First, a quick and dirty CSS reset is used to help normalize the rendering from the various browsers. Then the mapping container is sized and a bit of margin is added to the controls container. The ‘uiElem’ style is used to set the font size, margins, and padding appropriate for use on small screens that are ‘touch’ driven. In other-words big buttons for my big fingers. There are no images (except the Google Maps tiles) used to style the above markup. Instead, I am using CSS3 gradients to render the buttons. The folks a Web Design Wall have provided some amazing styles. The first loads in jQuery and the second enables access to the Google mapping API. var minDistance = 0.05;     // Minimum distance (miles) between collected points. var isStarted = false;      // Flag tracking the application state. var positionTimer;          // The id of the position timer. The above globals are used to store application data and track state. Next we look at the event handlers for the three buttons (start/stop, reset, and map it). The first event handler is for the ‘start/stop’ button. The most important thing happening here is the GPS collection is either started or stopped. There is also a bit of dynamic styling to add a visual indication of the application’s state. The ‘reset’ button simply deletes the collected points, resets the global variables, and updates the UI by calling the ‘updateStatus’ and ‘clearMarkers’ functions (below). Finally, the ‘map it’ button calls the ‘showPoints’ method to display the points on the map. Next are the start and stop functions that control the collection of GPS data. // Check to see if this browser supports geolocation. // Ignore all low accuracy points. // Ignore points that are within a certain distance to the last point. The first bit of logic inside the ‘watchPosition’ callback function determines if the accuracy of the collected point is good enough. 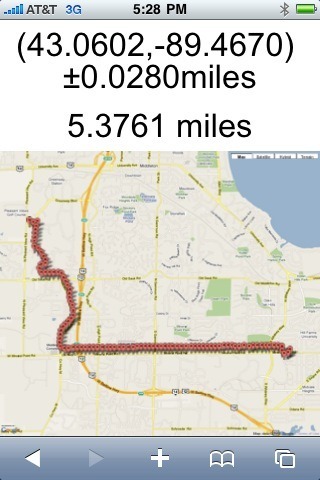 The 0.5 mile tolerance was heuristically calculated using my iPhone. The first couple of points can be quite inaccurate. They are probably early estimates of position using either cell phone tower technology or IP lookup. Next we determines if the new point is far enough away from the last collected point to be processed. This prevents the accumulation of points at long stop lights. If the point passes this filter, it is added to the collection, the current location data is set and the status is updated. The map is created when the page loads. When the ‘Map It’ button is pressed, the ‘showPoints’ function is called. That function first clears any current markers from the map and does a quick check for the no data case. 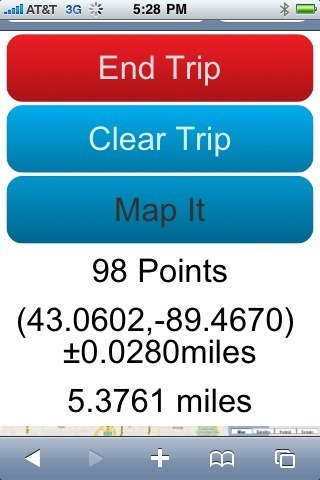 If there is data, it loops over all the collected points and adds a marker to the map for each point. Inside this loop, the min/max latitude and longitude are collected. Finally, the map is zoomed to fit the collected points. As our mobile devices become equipped with GPS receivers the mobile browsers are exposing API to access this data. The future will see more location aware applications. I believe geo-fencing will become very common. Useful info. Fortunate me I discovered your web site by chance, and I’m surprised why this coincidence didn’t took place earlier! I bookmarked it. Thanks for your guides. it’s really helpful. and i’m studying Java Reader too. that’s also helpful. thanks for your wonderful efforts its really a good job . Please tell me that how can I download the source to explore. The demo has all the code. There is not server side code for this example. I have downloaded the TruckTracker, but I have a problem with login OpenId, i use my gmail account and _openid.GetResponse() return null. I modified the code to call create user with method CreateUser(response.ClaimedIdentifier, firstName, lastName, email) but is it has error on the users table users. do you have the users table for TruckTracker? Bob, awesome work on the project! Would love to see any updates if you have done anything with this. I am specifically interested in your experience with iPhone browser restriction to run JS in the background, if you manged to find workaround, when phone is idle black screen, or browser is minimized the JS will stop running, hens the Trip Recorder will stop recording. Also have you looked at or done anything with speed calculation? Thanks again for great work and sharing it with the world ! I don’t do comments but i had to on this article. You just saved me a ton of googling. Thank you so much. Is it possible to change to meters instead of miles? I want to track the walking distance of user from one point to another. How to do you draw the points as a route instead of showing all the points on the map?